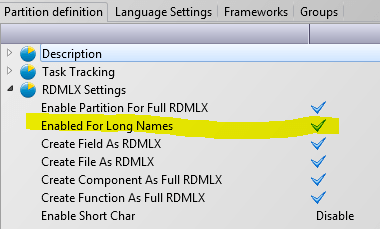 Some users have questioned why the 'Enable for Long Names' partition option is no longer available in V13 SP2. In fact, this option is still available but was removed as a partition setting in V13 SP1. Initially, 'Enable for Long Names' was made a partition option so users could understand the impacts and consequences of using long names. For example, in a situation where a user could give fields long names, recompile their files and the column names would change and any non-LANSA code using these tables might be affected. 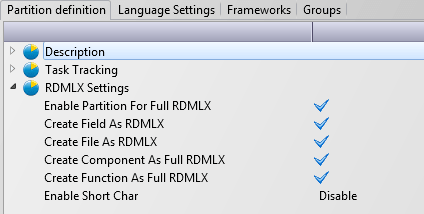 However, given that you are always enabled for long names in an RDMLX partition, a partition level option is not required. Instead, since V13 SP1, the option is available as a File attribute via the 'Enable for Long Names' flag on the individual file. Note: There are still some references in the Online documentation to the partition level option. These references will be removed. 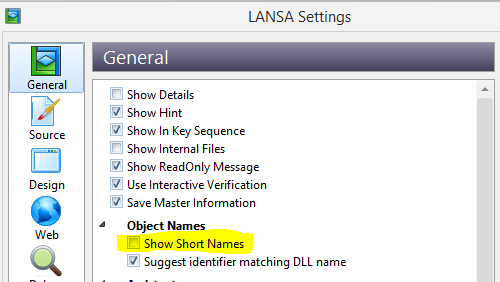 If you wish to only View short names in the IDE, this can be set from the General LANSA settings.